The trigger for the bad day for US stocks on Friday was the disappointing economic readings from Europe, especially the powerhouse called Germany, with its manufacturing sector contracting for the third month in a row. The IHS Markit’s flash euro zone composite Purchasing Managers’ Index (PMI) (yes, I know it’s a mouthful) fell to 51.3 in March from 51.9 the previous month, when analysts were expecting a reading of 52. This downgrading of growth has been factored into bond yields, which resulted in the headline that the bond yield curve was inverting and therefore is negative. And an inverted yield curve can be a pretty reliable early sign that a recession is on the way! But slow down on your fear, loathing and anxiety because it’s not a 100% certain indicator. And though it has a reasonable record, Morgan’s chief economist Michael Knox tells me there can be eight quarters before the recession shows up. So a stock market could easily rise for six quarters before it turns tail and runs. Let’s take a look at the Global Financial Crisis story of 2008, when the yield curve actually inverted in 2006. 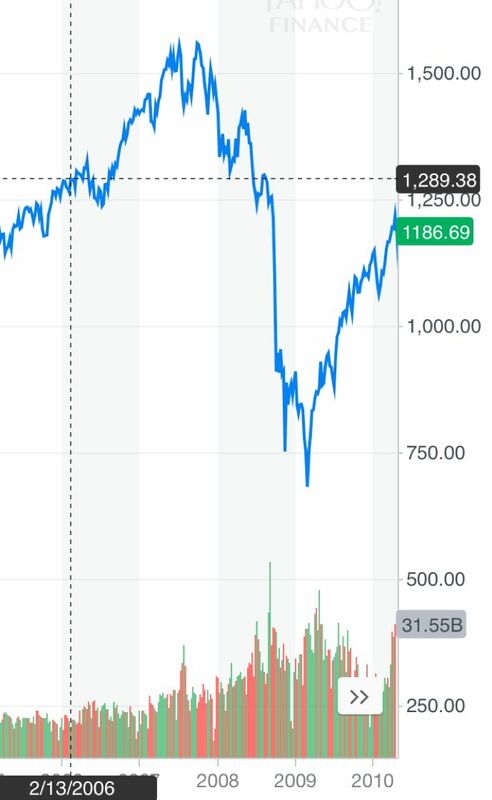 I’ve taken a screen shot of what the S&P 500 did in the time after the inversion and the peak of the US stock market before the crash. My rough figuring shows that despite an inverted yield curve, the stock market rose by about 22%. Remember that crash came about, in part, because debt ratings agencies were not completely accurate in their assessments of collateralized debt obligations. The current guess on the economy shows up in what US Treasury bonds are doing. The yellow line tracks the 10-year bond. In November, it was over 3.2% but it’s now just over 2.4%. The green line is the 90-day bond rate. It’s higher than the 10-year rate so not only does that create a curve or line that’s sloping in a negative way, it tells you that economic forecasters think a recession is coming when interest rates will fall. If everyone believed the story that this slowdown is a passing phase, then the 10-year bond rate would be higher than the shorter-term rates. Note the red and blue line rates are even lower because that’s the likely timeframe within which a recession should show up. 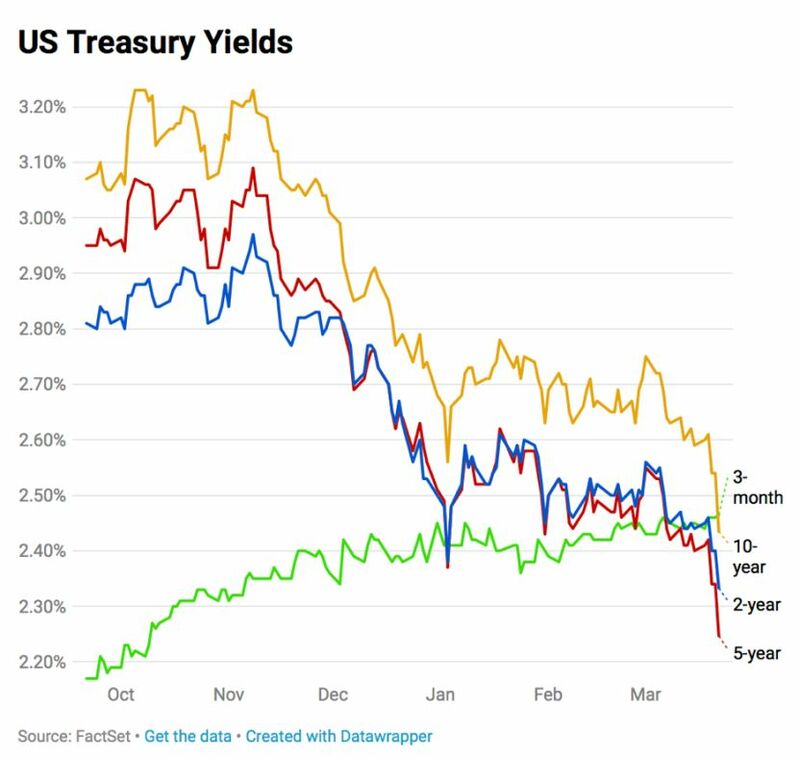 “In early-Jan 2019 we noted that the flattening in the US yield curve was starting to flash amber recession signals and that would keep the Fed cautious and listening to markets with the risk that the Fed was unlikely to hike this year. Since then curves have started to invert, with the important 3m/10yr curve inverting for the first time since 2007 today on the back of a very weak German PMI print. “We have re-run our preferred yield curve recession models, which now suggest a 30-35% chance of a US recession occurring over the next 10-18m (up from 20-25% previously). Importantly for the outlook, these probabilities are close to the critical levels where recessions have inevitably followed (typically a 40-60% probability sees a recession within the next 10-18m). What could save us from a recession in a short period of time? A US/China trade deal signed. The Fed no longer threatening interest rate rises. The EU puts its hand up for stimulus via cheap loans for banks and no premature rate rises. China embarks on a stimulus programme. Donald Trump, the most stock market sensitive President ever, doesn’t want a recession and stock market crash before November 2020, when the Yanks go back to the polls. The upcoming local Budget will be a pre-election tax cut effort. The post-election bounce effect, when uncertainty is taken away. The RBA could easily cut interest rates, if not soon, then after the election. NAB’s economics team, which expect two cuts this year, thinks the first will be in July. The house price fall and the related anxiety might be dissipating sometime between now and mid-year. What also is interesting is that inverting bond yields and recessions, along with crashing stock markets, usually occur after a period of sustained interest rate rises, which hasn’t been the case this time around. Therefore the unique circumstances of the current economic scenario might work against predictable outcomes. Economic rebounds in China, the EU, the US and locally are what I’m going to be on the lookout for. These much-needed rebounds should put pressure on Donald to help make a lot of this happen. Over the weekend in a conference in Beijing, Jeffrey Sachs, a professor at Columbia University, blamed the US President for many of our economic challenges right now. “The problem with the trade talks is that it’s all based on a false premise. The premise is that somehow China’s trade imbalance is because of unfair practices. This is the kind of economic illiteracy of the president of the United States,” reported CNBC. China does play unfair in trade but this trade war escalation and the share price falls of big US international trading companies suggests this battle with tariffs hasn’t been good for the global economy. Jackson Wong, associate director at Huarong International Securities, is tipping a 15% gain for stocks for the rest of the year, when a trade deal is inked! You’ve got to hope Jackson is smart and not on any medication!